On the dawn of the day that Scots decided whether to sever the 300-year-old union with England, the three members of my family who were eligible to vote were split. One was for separation and independence for Scotland. Another was definitely a “no;” it was better to stay together. The third was undecided. The “no” voter wanted to keep her British citizenship and remain part of a wider world than just Scotland. The only reason she would vote for Scottish independence would be if the English wanted to leave the European Union, but that referendum comes after the Scottish one, if it ever comes. The “yes” voter was incensed by the heavy-handed and condescending “Better Together” campaign, which threatened the Scots with dire consequences if they voted yes. It was even suggested that Scotland could end up like the Weimar Republic that preceded the Nazis in Germany. Several years ago the English were caught trying to change off–shore borders so that England would have a greater share of North Sea oil. The Tory government in Westminster said the Scots couldn’t keep the pound sterling and that there might be strict border controls if Scotland separated. Given that you can take a train from Belfast in British Northern Ireland to Dublin in the Irish Republic without even knowing where the border lies, the threat seemed especially mean-spirited. But if the threats seemed exaggerated, the “yes” campaign’s promises that little would change, that Scotland would keep the pound, enter the European Union on its own, and prosper on diminishing oil revenues, were also unrealistic. 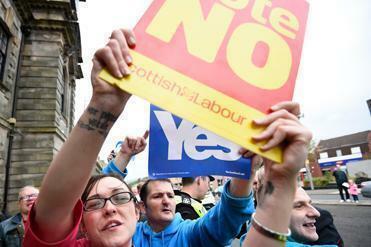 A quiet swath of Scots brought to the ballot box a conviction that the UK is better together. Scotland has long had its own legal and educational systems and a culture that goes deeper than kilts and bag pipers. And the Scots have had more than their share of political power in Westminster, with close to a dozen prime minister coming from north of the River Tweed. Scots helped England run the empire when Britain ruled a quarter of the Globe. The ties run deep. For three centuries Scots have fought alongside the English, in wars ranging from Africa, India, and Afghanistan to trying to put down American independence. In the epic struggle of World War I the Germans called them “Ladies from Hell” because they came out of the trenches wearing kilts. In World War II, the skirl of bag pipes was heard wherever British troops were engaged. If the vote had gone against England, the English would have had only themselves to blame. The “Better Together” relied too much on threat, and didn’t come to grips with the emotional pull of Scottish independence, concentrating only on economic matters and the punishment they would exact. The “yes” side played up an older history of William “Braveheart” Wallace and Robert the Bruce and their struggles against superior English forces many centuries ago. It was as if there were no history after the 17th century, when James VI of Scotland became James I of England. A century later Scotland decided to join England in a political union, selling out for English gold, as the great Scottish poet Robert Burns put it. But there can be no doubt that Scotland benefited from the union. I have been dropping in on the Scottish Nationalists for the last decade, and they have emerged from an amusing fringe party that few took seriously to taking control of the Scottish parliament under the capable leadership of Alex Salmond — probably the most capable politician in the British Isles. As for British Prime Minister David Cameron, he made a bad bet when he insisted on a straight up and down yes or no vote on Scotland’s independence. Salmond had wanted to give more power to Scotland without the break as an option. As a professor at St. Andrews told me: “Every time Cameron opens his mouth, another 100,000 Scots go over to the ‘yes’ side.’’ As it was, Cameron had to come crawling back and offer Scotland more devolution if it would stay in the union. Over the years I saw a class element sneak into the debate. The educated and middle-class Scots trended toward keeping the union, while the poorer, working-class Scots, who saw heavy industry collapse take their jobs away, tended to prefer a role of the dice to see if their condition might not be made better by going it alone. Indeed Scotland would like a Scandinavian-style socialism, while London and the southern counties are Tory and can’t do enough for the one percent, at least in Scottish eyes. If Scotland had decided to go its own way, it could have been a reasonable, small country like Denmark — prosperous without bothering any of its neighbors. The long history of glory would be gone, but then that period is now in the rear view mirror of Great Britain as a whole. Indeed, if the European Union does become more of a political union, it could be that the nation states of Europe will recede and the regions will emerge as important entities. No doubt a “yes” vote is a little like jumping off the diving board without knowing how much water is in the pool. What will be the currency? What will be the division of the spoils between the two separate countries, and how will they share the national debt? Will the EU accept Scotland? But Prince Andrew, brother of the Prince of Wales, was heard to say that “devolution,” giving Scotland back its own parliament with limited powers, would mean Scotland would separate in five years. That was 1999, so it has been a bit longer, but Andrew wasn’t all wrong (although a member of the royal family shouldn’t be involved in politics). As the day of decision wore on, I checked in with the one undecided member of the family. The vote, in the end, was “no.” Better to stay with England, Wales, and Northern Ireland. And that’s the way Scotland decided to go when all the votes were counted. Now it will be up to Cameron to keep his promises of more devolution to the Scottish parliament, and for Salmond to heal the wounds of a sometimes bitter division. What happens to the Union Jack if Scotland leaves? Evan Horowitz: Are Scotland and England breaking up? Opinion | Greenway: Independence Day for Scotland? H.D.S. Greenway is a former editorial page editor of the Globe.